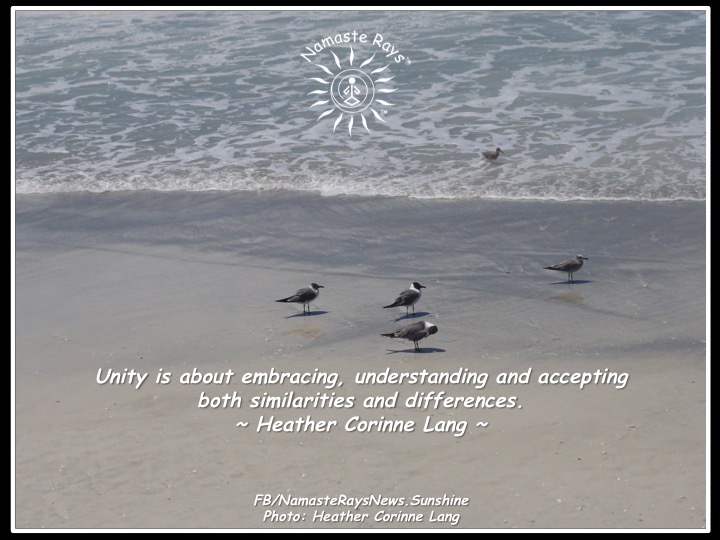 Unity is about embracing, understanding and accepting both similarities and differences. To be in union with others doesn’t mean we have to be exactly like any other, mimic anyone or conform to anyone. It doesn’t entail uniformity. Unity is bringing all the similarities and differences together as One Union of Souls. It is combining the forces of each person to live a life of balance with each other. It is offering your gifts and accepting the gifts of others without competition. It is recognizing the beauty of another, and accepting the beauty of yourself. Unity is understanding we all have different personalities and still seeing the Light within each one of us. Being in union is understanding our beliefs, thoughts & opinions may differ from others, and they may not. Differences are simply different, they are not better or worse than someone else’s. Our paths in this life are meant to be different, therefore, where some believe in one type of religion, others do not believe in any. Where some are of one political viewpoint, others have another. Unity is accepting all of this, and embracing it to live in balance, peace & harmony. Balance is the key and one of the lesson’s many of us are learning whether it is balancing our individual lives, balancing our lives with our family & friends, or finding balance in our world as a whole. Unity is the balance of bringing together both the similarities and differences. The differences of each person are intended to help us cultivate compassion and love for each other. The similarities are intended to bring us together to live in union with the uniqueness of each person. We were never meant to do everything all by ourselves, as we couldn’t possibly do it all. We are meant to share, give and be with others. While one person sings, another dances. While one person writes, another reads. While one person plans, another executes. While one swims, another runs. While one faces east, another faces west. It is those differences which balance out the unity of the entire group, the whole entity or the community with the similarities. It is each of us embracing, understanding and accepting our own gifts and talents, as well as those of others. Unity is about sharing with each other for the betterment of the whole. It brings the whole together as One. It is recognizing the One is many, yet as many we work as One.